Invisible.Ink Tattoo Removal Specialists are proud to partner with Vixon to deliver results in medical grade Tattoo Lightening, Modification + Removal. Born of 12 years of Nursing, Medical Device education and Cosmeceutical Skincare experience & with a healthy respect for the allure & personal significance of tattooing, I.ITRS have taken a specialised approach to tattoo removal: it’s all they do, so you can feel reassured that the laser that’s treating you is in the hands of a dedicated expert. Together with Vixon, I.ITRS have made it their mission to convert the tattoo experience you now rue, to utter skin love! 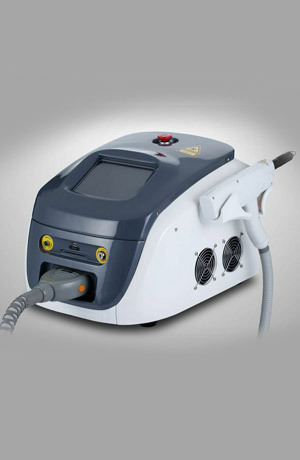 The laser delivers high intensity light pulses into the area. The tattoo inks selectively absorb the light without damaging the normal surrounding skin tissue in the process. The tattoo ink is broken into smaller particles that are harmlessly removed by the body in the weeks following treatment. It doesn’t feel like being licked by a rainbow, we’ll give it to you straight. We advise our clients to expect a certain level of discomfort however, it’s very manageable. The process is best described as having an elastic band snapped onto your skin or having specks of hot bacon grease hit it. Pain thresholds vary from one individual to another and so it really depends on YOUR personal experience. We certainly try to minimise the pain and strongly advise that you apply a topical anaesthetic 1 hour prior to your appointment, as all clients find that it dulls the effect significantly. There are some great options available through pharmacies. If there isn’t any scarring in the tattoo before we start, then there shouldn’t be any when we finish. The chances of scarring are minimal if you follow the aftercare directions we provide during your consultation. The lasers we use pulse with nanosecond speed, limiting the heat build-up and associated scarring that were typical with older style lasers. We provide a cost for each session based on the dimensions of your tattoo and an estimated amount of treatments that will be required. We’re happy to discuss package options with you to offer some cost relief, however, our priority is safety and efficacy. With Vixon & Invisible.Ink, you’re investing in expert treatment. Professional tattoos usually require 6 – 10 treatment sessions for total removal. Amateur tattoos tend to require fewer sessions. The depth, colour and amount of ink, as well as the location of the tattoo on the body, are all determining factors in how quickly the tattoo can be removed. Your immune system is also a key determinant in successful clearing and this will be discussed at your first consultation. Each tattoo is as unique as the individual who wears it and so the treatment regime will vary. Removing a professionally applied tattoo is a process that usually requires a series of treatments spaced 6-8 weeks apart. We prefer to treat your ink at 8 week intervals for optimal fading and highly recommend this for total removal. Fade out in preparation for a new tattoo can be assessed by your artist and we can adjust the frequency from there. Appointments spaced 6 weeks apart are our ‘ethical minimum’ though, so please factor this in when negotiating your cover up timeframes. Remember, there’s no such thing as ‘quick’ tattoo removal. They are designed to be permanent after all! Can I just have part of my tattoo removed/lightened? Absolutely, we can remove as much or as little of your tattoo as you like. Our lasers are very precise and it’s possible to remove defined parts of your tattoo with accuracy to a point of approximately 2mm – just discuss what you want with your technician at your initial consultation or arrange a time for your artist to describe it to them for you. If you are planning on re-inking after the treatment, it’s critical that you wait until the site is fully healed – this will be at least 6-8 weeks and needs to be assessed carefully by your tattooist. Offering the convenience of Sunday appointments, Invisible.Ink TRS are ready to convert your unloved ‘distasterpiece’ to your desired masterpiece. Call Vixon to schedule your appointment today. Invisible.Ink Tattoo Removal Specialists require 24hr notice for all appointment amendments or cancellations. The full deposit amount of $80 for treatments or $50 for consultations, will be forfeited in lieu of such notice. The payment securing your appointment with our specialist will indicate your acceptance of these terms.